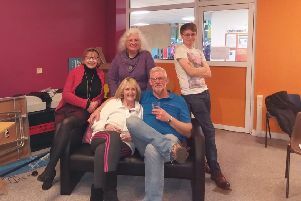 An amateur repertory society is kicking off the year in splendid fashion by doing a pantomime at Whissendine Village Hall. Audiences are invited to join Whissendine STARS for their production of Aladdin on Friday, February 2, at 7.30pm and Saturday, February 3, at 2.30pm and 7.30pm. Jill Fenby-Taylor of the STARS said: “It’s a lovely funny, family-friendly pantomime with not one but two genies, Aladdin, the princess, Widow Twankey, Wishee Washey and a couple of policemen. People are advised to buy their tickets quick as seats are allocated, so you can choose where to sit. Refreshments are available for all performances and during evening shows there will be a bar open from 7pm. Tickets are £6 for adults and £5 for concessions. They can be purchased from Whissendine Village Shop on (01664) 474964. Whissendine STARS have produced over 50 shows in the village including A Murder has been Arranged, The Present Mine in Whissendine, Wolfsbane, Beauty and the Beast, Puss in Boots, Excalibur, The Odd Couple and Alice In Wonderland.